Alfred Eugen Ritter and Clara Ritter, née Göttle founded the chocolate and confectionery factory at Innere Moltkestraße in the Stuttgart district of Bad Cannstatt and the first cornerstone for RITTER SPORT's chocolate history was laid - this was where the first "Ritter" chocolates were made and sold. 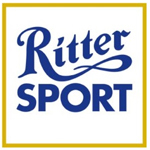 The chocolate square is launched under the name "Ritter's Sport Chocolate". Clara Ritter's proposal to produce a square chocolate bar quickly meets with approval in the family. "Let's make a chocolate bar that fits in everyone's jacket pocket without breaking and weighs the same as a normal long bar." The range also includes long bars, boxes of chocolates, Easter and Christmas items. Buy Ritter Sport chocolates online from Chocokick.Com and at best prices in India.